Bonita received her BBA degree with a major in accounting from Columbus State University in 1994, formerly known as Columbus College in Columbus, Georgia. She successfully received her Certified Public Accountant certificate from the State of Georgia in 1997. Bonita has been employed with AJK, LLC since 1986 and currently serves as a manager with the professional auditing staff of the firm. She is experienced with the auditing and accounting services of local governments, financial institutions and construction/contractor companies. Additionally, Bonita has experience with the firm in tax return preparation for individuals, corporations, and partnerships. 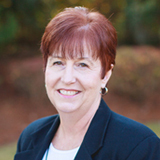 She is a member of the American Institute of Certified Public Accountants and the Georgia Society of CPA’s. Bonita and her husband, Greg, live in Warm Springs, Georgia and are members of Trinity United Methodist Church. They enjoy traveling and spending time with their four daughters and ten grandchildren.